Which came first: the egg or the… tampon? Beauty trends are all always up and coming, but have we taken it a little too far? 2017 hasn’t been around that long yet, but some of the weirdest beauty trends have been emerging as of late. Appearing in one of popular makeup vlogger Nadi’s (popLuxe) most recent tutorials, a peeled hard-boiled egg is used as a beauty blender. 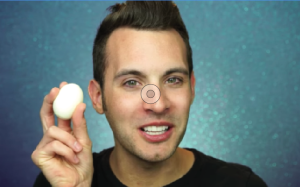 In the beginning of the video he mentions that based on the comments by fans on YouTube, he will use any household item to apply his makeup and decided to begin with the egg. During the video he says, “Oh my gosh, this is actually working really, really well. This kind of feels like a r eally cold SiliSponge, but it smells like sewage, like eggs, so that’s a turnoff — but it’s actually doing a pretty good job.” His comment on the smell should have been the first clue to viewers to not adopt this trend. While we all know what tampons are supposed to be used for, but others are finding alternative routes for their cotton friends. In an Instagram video, Los Angeles beauty blogger Ashley Blue DeFrancesco used a tampon to apply her foundation, according to Cosmopolitan. However, don’t expect this beauty trend to go very far. Because of the cotton material, Cosmopolitan mentioned that the tampon would absorb more makeup than necessary and “…the last thing you need is cotton fibers floating around on your face, tickling it to no avail.” Let’s hope tampons stick to their original job. Earlier this year, setting up the previous two weird trends with beauty blenders, beauty vloggers began using condoms to blend their foundation, according to Seventeen. But what about the lubrication? Well, according to Seventeen washing it off is a step you cannot miss. It begs the question, if you have to do all that work, why even bother? Seventeen says, “Apparently you get the best of both worlds: squishy texture that distributes makeup in tough-to-reach spots, without the wasteful absorption of a sponge.” So apparently, it’s more useful than the tampon, but still not an item one should be using on their face. Most people freak out when they color outside of the lines with lipstick and do anything to fix the problem. However, a new beauty trend is suggesting otherwise. In fact people are intentionally making sure that their lipstick is smudged surrounding their lips as well, calling this effect “lollipop lips,” according to the Today Show. Looking like a cross between Ronald McDonald and a vampire after feeding time is blatantly unflattering. “This, um, unique look originated on the runways of London Fashion Week at the Preen show and has taken off among the Instagram set in the past few weeks,” according to the Today Show. The same article says MAC Cosmetics introduced the trend. The trend makes one look too messy when makeup is used to look put together. We’ve all heard of tattooing eyeliner or even mascara, but now people are tattooing freckles. It costs $250 to get the once avoided trend on their face permanently, according to Allure. “When they are freshly done, (the freckles) will appear swollen, almost like bee stings… the swelling will go down within a couple hours, and you’ll be left with your cute, fresh freckles. Over the course of one to two months, the color will soften dramatically and look more natural,” a cosmetic tattoo artist Gabrielle Rainbow said in an Allure article. It seems like a very extreme measure to take to change the way you look. What happens if the freckle trend goes out of style once again and now you’re stuck with freckles on your face? If you really want freckles that badly, stick to making dots with eyeliner. Who knows what trends people will think up next? All one can hope is that these don’t become the norm.